Miss C was Minnie Mouse for Halloween this year! I have fond memories of the handmade red and white polka dot felt costume my Mom made for me when I was little. Painted face, black tights, and big ears finished with a red bow. Carrying on the tradition of handmade Halloween, I was excited to whip up a cute original for Miss C. Unfortunately Minnie patterns do not resemble the original red and white dot dress I knew growing up. Most are hot pink and with that modern flair. I decided to use another basic dress pattern that resembled the Minnie dress that featured puff sleeves, scoop neck, and full skirt. I chose McCall's Pattern M5793 and it was perfect! I altered the pattern a bit since this was only for a Halloween costume. The dress was made using Dress D (pictured in pink). I did line the bodice, but skipped making a skirt lining and petticoat, and omitted the bottom hem ruffle. The skirt still had plenty of fullness and oomph! The neck and sleeve hem was finished using white double fold bias tape. I also added a white satin ribbon sash with bow to complete her look. Overall the pattern was super easy to follow and to construct. 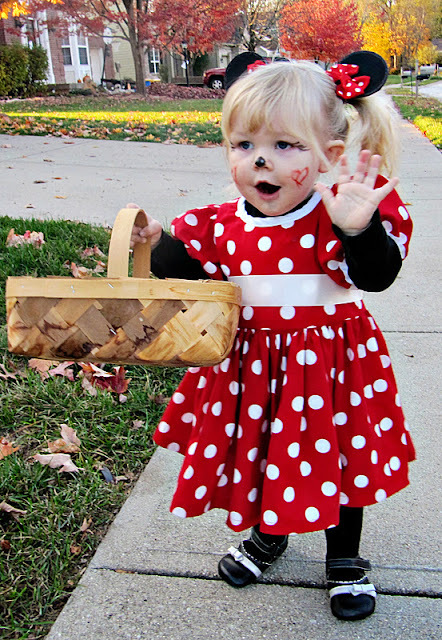 A little black nose, eyelashes, and red bow ears made Miss C one of the cutest Minnie Mouse girls! How cute! She seems to enjoy her costume a lot! she is sooo adorable! I love it! What a cute Minnie outfit! My MIL actually made a Minnie Mouse dress for my little one this Halloween. Yours is absolutely adorable! So cute! I actually bought this pattern awhile back and my daughter loves Mickey Mouse! thanks for the idea! I'm your newest follower and i'd love if you'd follow me back! She is ADORABLE! I think my little girl was probably about the same age when she was Minnie Mouse for halloween. Now that little girl jusr turned 16 this week. Time sure flies by! Oh my gosh she is adorable and you did such a fantastic job on her costume! 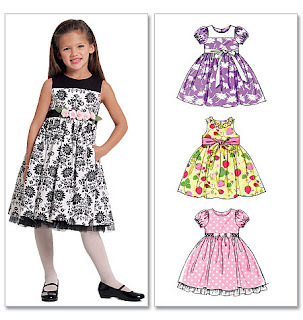 What a pretty dress,who wouldn't love it!thanks for sharing.